The joyride to the upside continued in the stock market last week as the S&P 500 surged another 2.5%. 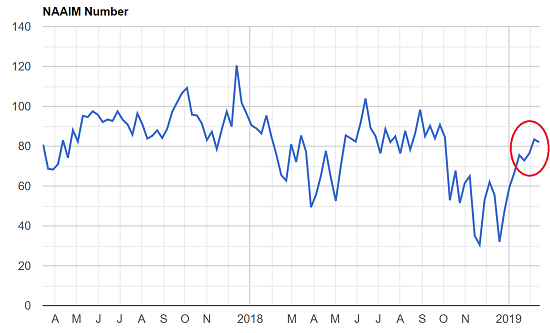 If my calculator is correct, that means the venerable blue-chip index is now up 10.7% so far in 2019 and has put in a nifty gain of 18% since the December 24th panic attack. Impressive. What is perhaps even more impressive from my seat is the reversal in Ms. Market’s mood. Recall that back in December, traders assumed the worst. Everything was bad. There was nothing positive to be found anywhere. All news was bad news. Even the good news (record holiday shopping for example) was ignored because the markets were doomed. The Fed had lost its way. The administration was planning to flush the hundreds of billions it spent on tax cuts down the drain with the trade war. And the “R-Word” (recession) dominated the global view. Insert sad emoji here. Now fast forward eight weeks. The S&P has soared. The index is back above its 200-day moving average. There is talk of a new bull market. I’m getting calls about keeping up with the stock market again. Everything is good. Nothing is bad. And any news that happens to fall in the disappointing category can simply be ignored. Amazing what an 18% gain in a couple months can do, right? 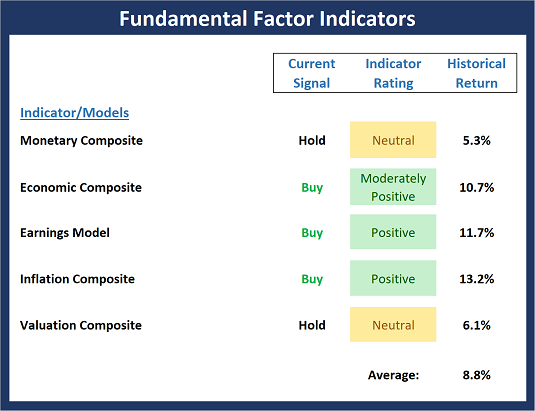 This week, we’re featuring the Fundamental Factors Board, which is a group of longer-term models designed to determine the overall fundamental backdrop to the “state” of the markets. Our take is the Fundamental Factors board currently suggests that the backdrop for equities remains constructive. For now, the board says the bulls should be given the benefit of any doubt and the dips should be bought. No Cigar For The Bears! I had thought by now that stocks would have paused or taken a little 1-2% mild pullback. There was evidence last week. There was evidence over the past two days. So far, no cigar for the bears. This is very much typical behavior when the stock market emerges from a major bottom as we saw at Christmas. They just don’t give you a chance to comfortably buy after the train leaves the station. Any and all pauses and pullbacks are shallow until a real one does come which pretty much signals an intermediate-term period of pause. But things are looking good right now. For example, the NYSE A/D Line which you can see below is but one strong day from all-time highs! This makes me chuckle as I vividly recall how the vast majority of pundits said a bear market had begun and 2019 would be disastrous for stocks. …. Is there a New Message from the Markets? In my last edition of WTWA I took note of the growing emphasis on technical indicators, even for long-term investors, asking whether the 200-day moving average should be considered. As often happens these days the stories focused on political developments and the surprise Amazon (AMZN) decision not to build a second headquarters in New York. 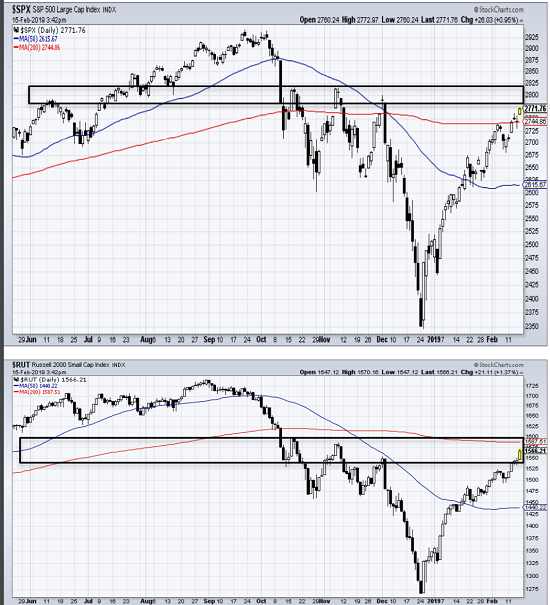 The S&P climbed above the 200-day MA on Friday without much fanfare. Next problem, please? I placed special emphasis on the economic news this week. Understanding the economic indicators and trends helps keep investors on the right track. Without this perspective it is easy to overreact to a single bad report or even a small decline from a peak. Don’t get fooled by a chart with a big red arc over the recent peak and an arrow pointing sharply lower. Every big decline starts at a peak, of course, but some precede plateaus or new peaks. Only time and more information will help determine which. I have made a few adjustments to the Market Monitor this month. While the changes are not major, I believe the adjustments will help communicate a clearer message. The report is now broken down into two primary sections: 1) Stock Market Environment and 2) Bond/Income Environment. The Stock Market Environment is intended to provide an overall feel for the state of the equity markets. My assessment includes a review of the primary cycles (secular and cyclical), the technical environment (including price trends and momentum), the fundamentals of the market (economic, earnings, monetary, inflation and valuation) and a newly added credit conditions section. Credit conditions are based primarily on the state of the high-yield market (i.e. 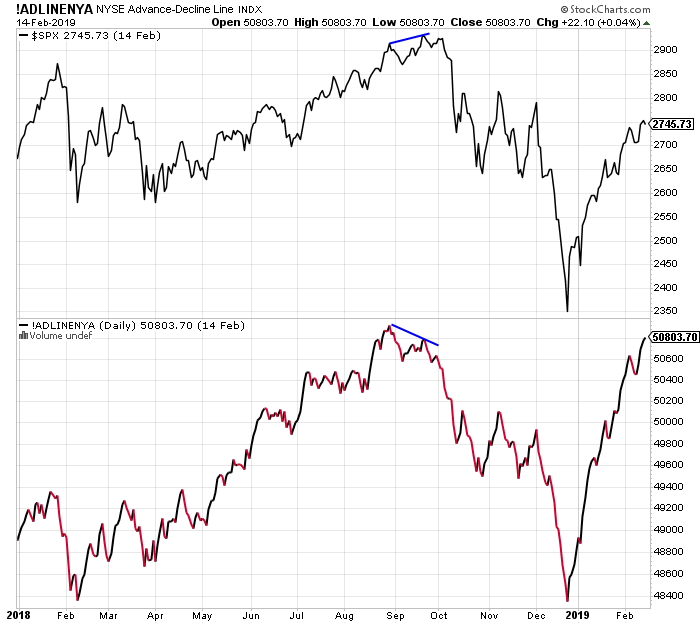 junk bond indicator), which is one of the best indicators of overall risk that I have found. The Bond/Income Environment is intended to provide an overview of the economic and interest rate sensitive bond and income groups that I follow. 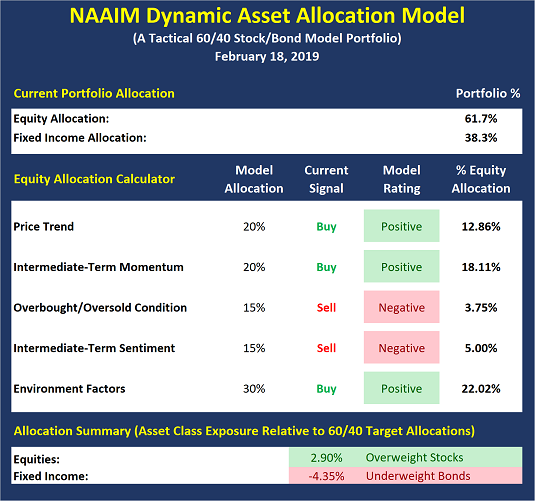 The bond/income groups tend to be less volatile but at times can provide extremely good risk-adjusted returns which can be beneficial to conservative investors as well as more aggressive investors looking to manage overall portfolio volatility. strength of the US economy is in some doubt. Etc, etc. The reasons to doubt are numerous and, yet, the market marches on. The power and influence of the Fed (and world banks) is not something to trifle with. Never fight the Fed. And so, with the Powell pivot a few weeks ago, the markets continue to believe that any weakness in the markets will be met by an accommodative Federal Reserve. The thinking has served this market well for several years and may well continue for some time. However, at some point in the future, either the Fed will not be so accommodative or even a dovish Fed will not be able to withstand the selling. But are we there yet? I am holding positions in the Cloud, Health and Bond space as they appear to be under institutional accumulation. I am seeing both strong fundamentals (sales and earnings) and technicals (chart patterns) and these “themes” appear to be in favor. Cloud Computing is storing and accessing data and programs over the Internet instead of your local computer. More and more businesses are moving to Cloud based services especially as Internet speeds increase (5G) and prices decline. Historically, Cloud and Health stocks have been very little affected by the China Trade War and if it is resolved shortly, I would still expect “big money” may support these themes. Bonds are generally doing well mainly because of an anticipated economic slow-down therefore I believe the market does not expect the Fed to raise rates any time soon. I happen to think the next move by the Fed will be to lower rates. I am seeking to buy leading stocks on weakness after exhibiting strength with the highest quality fundamentals, exhibiting the most strength in their industry groups. For example, at the beginning of October, with the stock market near all-time highs, the NAAIM Exposure Index stood at approximately 90%. However, by the end of November – and before December’s precipitous drop – the exposure index had dropped to 53.2%. Currently (mid-February) the Exposure Index is above 80%.